We have always sailed with Royal Caribbean and look forward to our cruises. I enjoyed it more than Oasis and here’s why. There are a lot more places to hang out and relax outside of your room and the pool areas. Oasis had Central Park which was very limited. Anthem has Two70 there are shows and events there but it’s super comfortable to hang out in and has great views. Lots of places to sit both inside and outside. 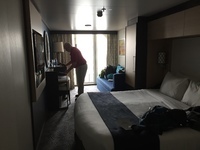 The staff was awesome and the ship was well maintained. The only exception being bathroom doors that were difficult to lock in public ladies rooms. The We Will Rock You was really good. There were a lot of activities going on for all ages. We had a balcony stateroom. It was one of the best layouts I’ve seen. Best for clothing storage-ample closets and drawers. We had an issue with air circulation and it was immediately resolved.